I had been asked by many friends, and my wife in particular, to write a book about my years in the Unification Church, founded by Reverend Sun Myung Moon, and my 33 years of experiences photographing True Parents. Somehow, the day I celebrated my 65th birthday, something suddenly urged me to get it done. I had written a few short testimonies, but the book was to be more in-depth, incorporating experiences, articles I’d written, dreams, a revelation, and a vision I received from God. There are many hundreds of elders, and brothers and sisters, who had been with True Parents far longer than I, are far more deserving than I, and who have had many more cherished, intimate moments with them. That I was able to have some moments with True Parents was a great blessing. Here are just a few of the experiences I had with True Parents. I had just returned from my second tour of duty in Vietnam and participated in trying to keep the 1973 Yom Kippur War from becoming World War III. When I arrived back in Honolulu, everything changed from a quiet center in an apartment building to a house behind Waikiki Beach, where everything was centered upon True Parents’ arrival for a major speech. To top it off, Rev. Ken Sudo was about to arrive with his International One World Crusade team of French and German members to witness to people to come to the banquet. On the day of the banquet, a huge rainstorm hit the island, causing major flooding everywhere, including the house where True Parents stayed. Everyone was worried about the banquet — if the guests would come. That night, we all gathered at the Hilton Hawaiian Village Hotel. The banquet room was ready, members were dressed in their finest. For the first time since I was five, I wore a suit, with a flowered Hawaiian tie. I was standing at the top of the escalator, with my new Nikon camera that I bought with my combat pay when True Parents suddenly appeared. Seeing them for the first time, I saw a bright light shine on them as they passed by me. I was so amazed that I forgot to take a picture. True Parents stood in the receiving line, with Dr. Bo Hi Pak and President Neil Salonen, as they greeted the guests. More and more arrived, all in their Hawaiian suits and dresses, with smiles as they greeted True Parents. Before we knew it, the banquet hall was full. I took one photo of True Parents looking into the hall before they entered, and True Mother had her mouth open in amazement. Despite a terrible storm during the day, our banquet turned out to be the largest of the 32-City Tour. 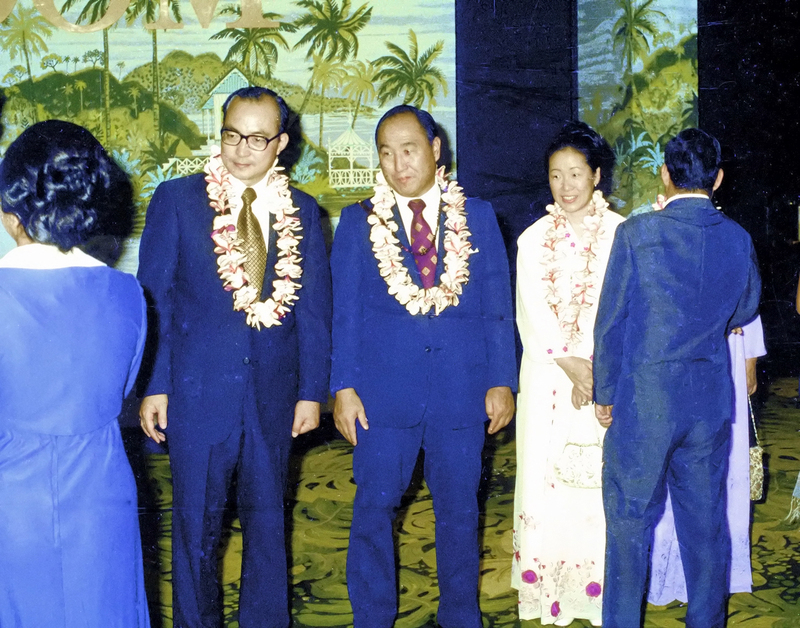 True Parents and Dr. Bo Hi Pak receiving guests at the Honolulu banquet in 1974. June 1: We held morning pledge ceremony in the hotel, and then we went to the Stadium around noontime. We prepared the equipment and received last minute instructions and preparations. At about 5 pm, while I was still inside, gusts of wind suddenly came with heavy rains. We went outside and saw sheet music from the Go World Brass Band, all muddy and wet, strewn over the hallway floor. Outside, debris from the storm littered the playing field around the stage. People were slow in coming. When the time arrived for the main event, I saw True Parents in the first base dugout. They had very serious expressions on their faces. I became spiritually drained. President Salonen was very concerned about True Father’s safety and asked that I walk behind True Father and Dr. Bo Hi Pak out to the stage. I didn’t think I could be much of a shield for True Father, but I tried. Thankfully, Mike McDevitt walked beside us. 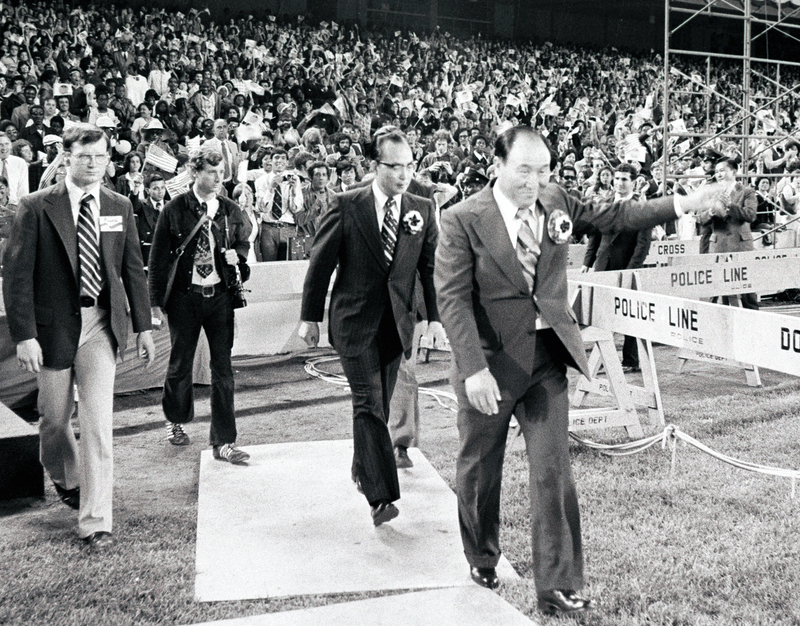 Ken Owens (second from left) following True Father and Dr. Pak out to the stage at Yankee Stadium, June 1976. He had been asked to serve as added protection for True Father in a volatile atmosphere than might have become hostile. It was a blessing to be on the field with True Father, but I also felt I didn’t deserve it. Throughout his talk, I kept circling the stage, helping Mike with his cameras and taking a few photos myself. After True Father finished, I again walked behind them back to the first base dugout. I looked at the members in the stands. There were many different expressions on their faces: happy, serious, sad, and tearful. 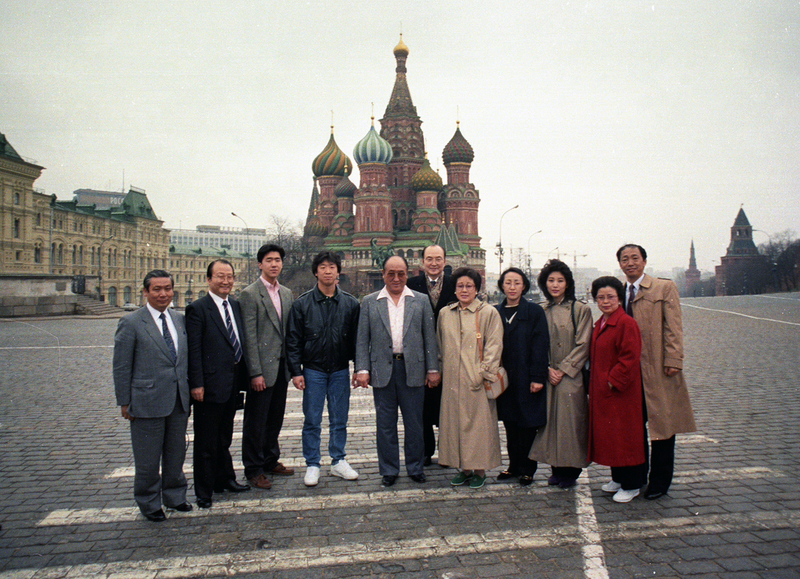 In April 1990, True Parents fulfilled their goal set after the 1976 Washington Monument rally of going to Moscow. As Founders, they came to attend the 11th World Media Conference, 3rd Summit Council for World Peace, and 9th AULA International Conference. When they arrived at the airport, members of the Soviet media, who helped organize the media conference, welcomed True Parents with smiles and hope. The conferences were important events, but it was True Parents meeting with President Gorbachev that was the most important. We were escorted into the Kremlin, and then into the main conference room where the country’s leader always welcomed special guests. Mr. Kwon, the Korean photographer, and myself were grouped with the other photographers and video people near the back and, for ten minutes or so, were able to take all the pictures we wanted. Then, Mr. Kwon and I were escorted out and had to wait outside. But, they would let one of us stay for the end. Since Mr. Kwon was senior, I gave him a magazine of film so that he could take photos for me, and he stayed. I had to be escorted out of the Kremlin and wait outside the gate. History shows that this meeting was historic. But, Mr. Kwon never gave me my film back. True Parents, True Family and entourage sightseeing in Red Square after meeting President Gorbachev. The last night of our stay ended when President and Mrs. Gorbachev, as guests of True Parents, watched the Little Angels Children’s Folk Ballet sing and dance for them. Mrs. Gorbachev totally fell in love with them. We took photos of them with True Parents, Dr. Pak and the Little Angels on the stage afterward. It was a complete victory for True Parents. Next stop for them in the communist world would be North Korea in late 1991. At the time of Kwon Jin Nim and Sun Jin Nim’s Holy Blessing in 1995, after the main ceremony, I had to do various portraits of the brides and grooms with True Parents and their in-laws. The Manhattan Center arranged that instead of a ladder, I would climb up a shaky scaffolding to get a better angle for the photos. Even with four strong second generation brothers holding it, the scaffolding was still wobbly. True Father wanted to make it a joyous experience, and seeing me on top of this scary place, he yelled: “Dance!” Carrying my camera and with hundreds of people in attendance, I began shaking and dancing on top of this moving object. Everyone was laughing and clapping and True Parents had big smiles on their faces. No one knew that even though I had a big smile, how scared I was dancing for True Parents at that moment. Ken Owens gave his testimony at Belvedere for Westrock Family Church Sunday Service in December 2015. While photographing many of the ministers during this tour, I was able to go to The Netherlands, where I was sent to my ancestral homeland, the very small town of Leeuwarden in Friesland, to give True Father’s speech there. One lady told me later that she became spiritually opened and saw over 200 of my Royal House of Orange ancestors appear and listen to the speech. 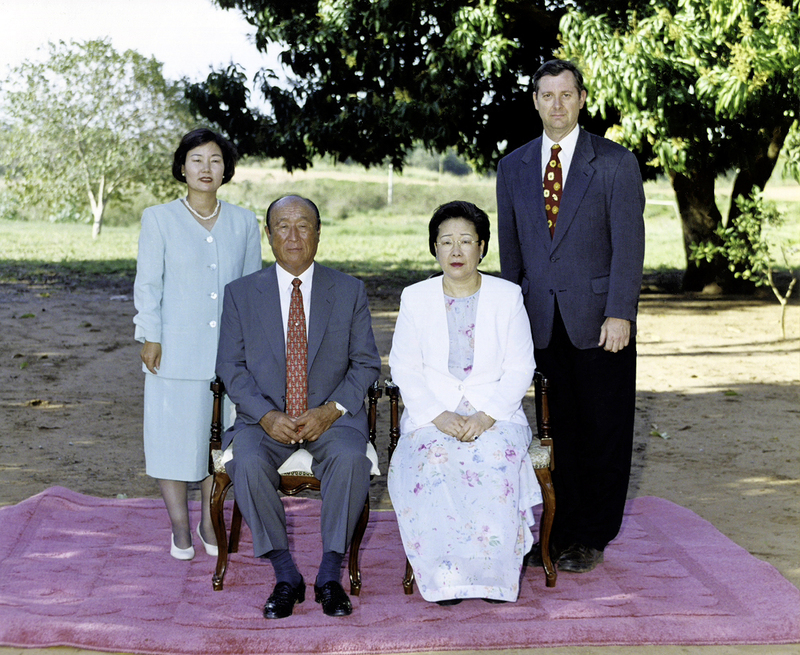 In the late 1990s, True Parents asked that all families go to the Jardim in the Pantanal for a 40-day workshop. During their visits, they would pose for special portraits for each couple. Since I had my camera equipment, I was asked to photograph many couples when True Parents did visit. It wasn’t easy for them to sit there for several hundred portraits, especially when it was 90 degrees. Sometimes they had to close their eyes for a few seconds. I would say my usual “One, two, kimchi!” in different languages so they would know when I would click the shutter. If the portraits were taken outside, it was even more difficult because of the sun. It was extra hard on True Mother because her eyes were very sensitive. But, True Parents did them because they loved the members very much. Ken and Meeyung Owens official portrait with True Parents. Photographing True Parents was a great honor, privilege and blessing. I wish I had done a lot more to make them happy. My heart has deepened tremendously through witnessing their love for God, for each other, for their children, and for all of us. They have put all their hopes, desires and dreams upon us. Let’s make them happy! My greatest joy is that I was able to make True Parents happy, especially when I said “Smile please” in my funny Korean. Ken Owens was born and served in the U.S. Navy and joined the Unification Church in Honolulu in July 1973. 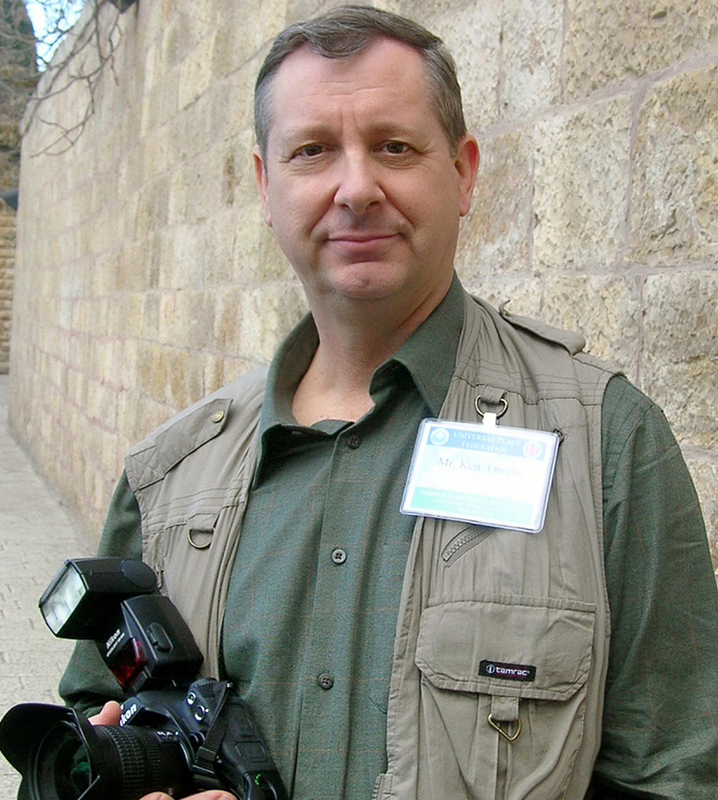 He worked at New Future Photo from 1980-2013. He and his wife Meeyung have three children. 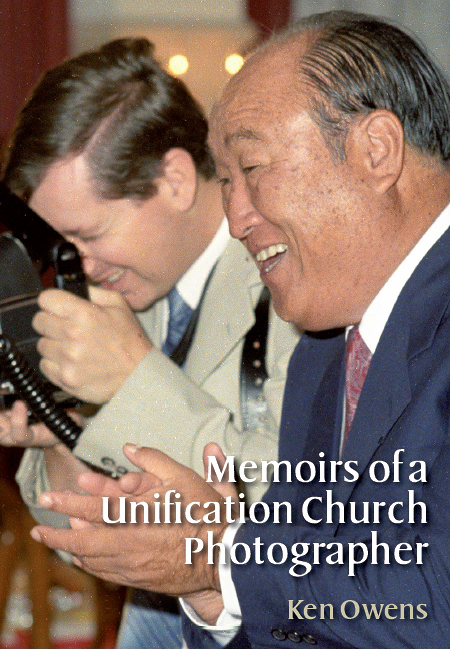 This article is adapted from his book, Memoirs of a Unification Church Photographer, available from Amazon.com. Book cover photo: Ken Owens photographing Shin Won Nim’s 100-Day ceremony beside True Father. Thank you, Ken, for sharing with us your precious testimonies of True Parents. Thanks, Ken. Just bought the book on Amazon. I can think of at least one friend to give it to as a gift as well. Looking forward to it!